"Jay [Cooke]'s tiny banking house [in Philadelphia] opened just as the Civil War began, The first lengthy con­flict of the industrial era, the war forced both sides to design, construct, and operate effective logistical systems as well as to raise money systematically. Besides raising taxes, another option was to print paper money and hope for battlefield success. This salutary approach (if one is not upset by inflation) worked quite well for the South but proved flawed after Gettysburg and Vicksburg. Unfortunately for the North, the Treasury had just $1.7 million in hand when Lincoln took office and was soon spending a million dollars a day. Given the lack of cash and what little tariffs and fees brought in, the federal government decided to assume a 90-day war. "Neither [Treasury Secretary Salmon] Chase nor Lincoln wanted to finance the war by printing money or adding high income taxes; so they temporized, attempting to sell bonds. "Following Fort Sumter, Cooke was determined to assist the North. ... While most Northern states gave the federal government men, equipment, and cash, Pennsylvania, which had promised 10,000 troops, was stymied because of previous bond defaults. 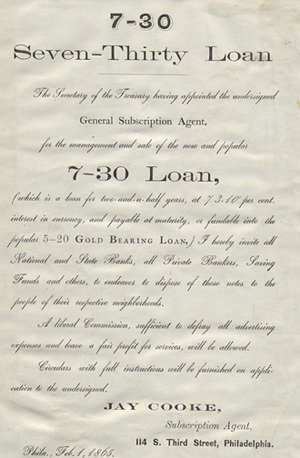 Cooke volunteered to sell the bonds but was rebuffed. He then watched helplessly as the state's financial officials discovered that they could not sell the bonds. Finally, they sheepishly came back to him. 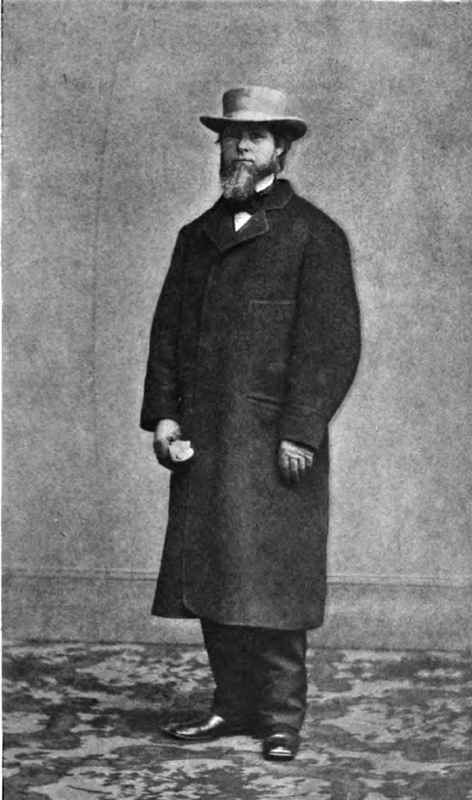 Upon receiving approval on May 28, Cooke charged ahead with his old friend Anthony J. Drexel, Philadelphia's dominant banker. In three weeks they sold over $3 million in bonds. Cooke himself subscribed $10,000, which became public knowledge and added to the public's faith in him: he sold only securities in which he also invested. "Mid-1864 saw another Northern crisis. Grant and William Tecumseh Sherman were stalled, casualties were horrific. Jubal Early's raid on Washington left Lincoln's reelection uncertain, and the $3 million-a-day war effort was in chaos. Chase resigned on June 29 and was replaced by Senator William Fessenden, who met with Cooke in July but -- put off by him -- gave him no business. In October, however, with only $5 million of a $40-million bond program sold, Fessenden gave Cooke $10 million, which he quickly sold. Cooke asked for the remaining $25 million and also sold these bonds. With Lincoln reelected and Congress now friendly, Cooke had sold another $200 million by February. On March 3, 1865, Congress approved the largest bond sale of the war, $600 million. Cooke said he could sell it all and, without opposition, was given the contract. ... Sales ended in July at $830 million ... with over 500,000 people purchasing bonds."